The Börgeson Laboratory is an engaged research team, located at the University of Gothenburg in Sweden. We are fortunate to be a part of the Wallenberg Centre for Molecular and Translational Medicine Wallenberg Center (WCMTM), which is a national effort to position Sweden as a world-leading life science nation. Our research is focused on the investigation of various aspects of cardiometabolic disease, ​with a special interest in inflammatory resolution. To address our hypotheses in a translational manner, we combine experimental studies with clinical basic research. This requires state-of-the art experimental and clinical facilities, as well as a broad network of expertise, which would not be possible without our outstanding collaborators. 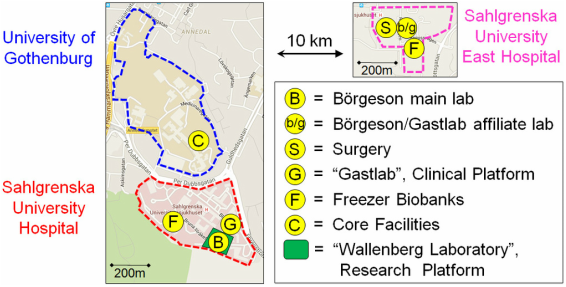 Our main laboratory is situated at the research platform called the “Wallenberg Laboratory”, which hosts 15 independent research groups at the Sahlgrenska University Hospital. Thus, our laboratory is in close proximity to our collaborators at the Gastlab clinical platform. Furthermore, Dr. Wallenius and his team perform gastric-bypass surgeries at the Sahlgrenska University East Hospital. Hence, we have an affiliated laboratory together with Gastlab and SOL at the East Hospital, to facilitate biopsy bio-banking and ex vivo tissue cultures.